The Raoul Wallenberg Centennial Celebration Commission is an effort spearheaded by The Friedlander Group to recognize the heroism and accomplishments shown by Raoul Wallenberg in honor of the centennial of his birth. Throughout 2012-2013, the Raoul Wallenberg Centennial Celebration Commission worked on a national campaign to highlight the incredible heroism exhibited by Raoul Wallenberg. The movement included the ceremonial naming of public streets and other venues and a Congressional Gold Medal campaign to commemorate the 100th birthday of Raoul Wallenberg and in turn, commemorate his actions and heroism. Raoul Wallenberg Centennial Celebration Act has passed the House and Senate; was enacted and signed by President Obama. The US Mint is in the process of designing the Raoul Wallenberg Congressional Gold Medal. Ezra Friedlander of the Wallenberg Commission is acting as liaison. 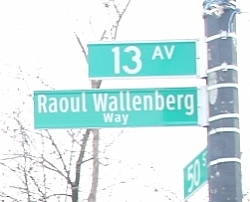 New York City Council legislation to co-name 13th Avenue, major thoroughway in Borough Park, Brooklyn as Raoul Wallenberg Way. 112th Congress Public Law 148 RAOUL WALLENBERG CENTENNIAL CELEBRATION ACT CONGRESSIONAL RECORD, Vol. 158 (2012): Apr. 16, considered and passed House. July 11, considered and passed Senate. Ceremony hosted by Councilmembers David Greenfiled and Brad Lander, who co-sponsored the co-naming legislation in the NYC Council Sunday, December 9th 12:00 pm 13th Avenue at 50th Street Brooklyn, NY.